A mangled, deranged face with bloodshot eyes tops a furry black body. Giant horns curl up from his head, displaying his half-goat, half-demon lineage. Behind this terror, a dozen more stomp through the snow of the streets of Lienz, Austria, among a din of cowbell jangles. The creatures dash through the streets, chasing giggling children and adults alike, poking them with sticks and scaring some with the realization that they were naughty this year. 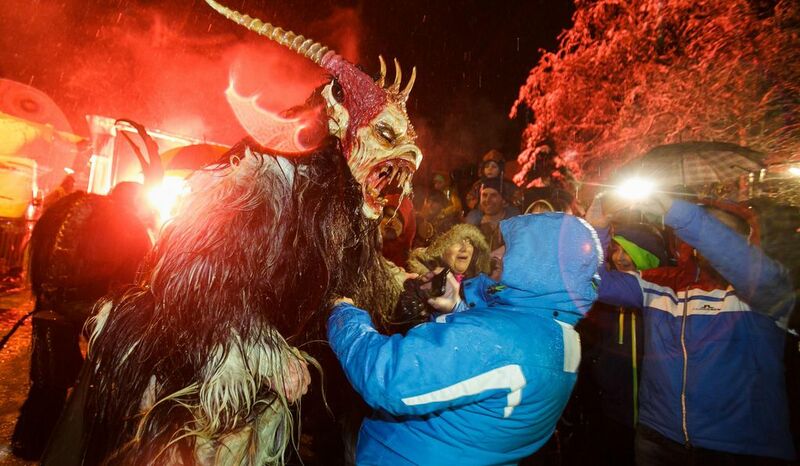 Lienz' annual Krampus Parade, also known as Perchtenlauf or Klaubaufe, resurrects a centuries-old tradition: Young men in town dress up as the mythical creature and parade through the streets in an ancient pagan ritual meant to disperse winter's ghosts. They march dressed in fur suits and carved wooden masks and carrying cowbells. 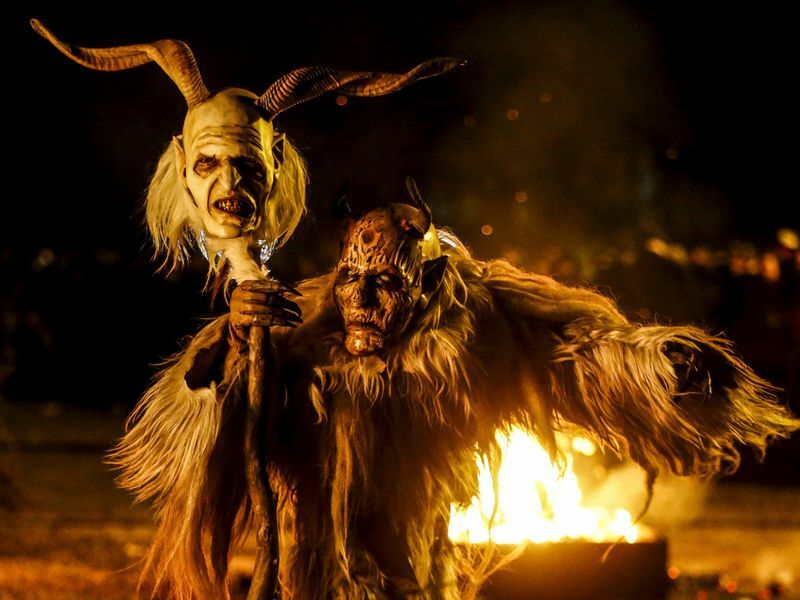 The tradition—also known as the Krampuslauf, or Krampus Run—is having a resurgence throughout Austria, Germany, Slovenia, Hungary and the Czech Republic, and has gained recognition in the United States. The creature has become so popular in recent times that he has a comic book series, parties of his own and even a new movie. After all, says Jeremy Seghers, organizer of a Krampusnacht festival being held for the first time in Orlando, Florida, why watch out when Santa Claus comes to town? "Because Krampus is coming to get you." Krampus himself historically comes around the night of December 5, tagging along with St. Nicholas. He visits houses all night with his saintly pal. While St. Nick is on hand to put candy in the shoes of good kids and birch twigs in the shoes of the bad, Krampus' particular specialty is punishing naughty children. Legend has it that throughout the Christmas season, misbehaved kids are beaten with birch branches or can disappear, stuffed into Krampus' sack and hauled off to his lair to be tortured or eaten. "The Krampus is the yin to St. Nick's yang," Seghers tells Smithsonian.com. "You have the saint, you have the devil. It taps into a subconscious macabre desire that a lot of people have that is the opposite of the saccharine Christmas a lot of us grew up with." In fact, Krampus' roots have nothing to do with Christmas. Instead, they date back to pre-Germanic paganism in the region. His name originates with the German krampen, which means "claw," and tradition has it that he is the son of the Norse god of the underworld, Hel. During the 12th century, the Catholic Church attempted to banish Krampus celebrations because of his resemblance to the devil. More eradication attempts followed in 1934 at the hands of Austria's conservative Christian Social Party. But none of it held, and Krampus emerged as a much-feared and beloved holiday force. A man dressed in a traditional Perchten costume and mask performs during a Perchten festival in the western Austrian village of Kappl, November 13, 2015. Each year in November and January, people in the western Austria regions dress up in Perchten (also known in some regions as Krampus or Tuifl) costumes and parade through the streets to perform a 1,500 year-old pagan ritual to disperse the ghosts of winter. A Krampus scares an onlooker during Krampuslauf. When you love Christmas, and Halloween, and decide to celebrate them at once?